The first Cuban Mind Sports Conference got underway today (Wednesday) in Camaguey, the island’s second largest city, at the Santa Cecilia Conference Center in the Plaza de los Trabadores under the auspices of the University of Camaguey. Under the watchful gaze of several images of Che Guevara, seventy or so participants assembled for the kickoff. Dr. Lazaro Bueno, the principal organizer, introduced Thomas Hsiang, the Executive Director of the International Mind Sports Association (IMSA), which helped to sponsor the event. Dr. Hsiang explained the rigorous criteria for admission to IMSA, and reviewed recent developments such as the University-Industry Cooperative Program, through which anyone who achieves dan level in go is guaranteed a job. The university, where the program began, now partners with more than 30 local businesses. After a brief discussion of Chinese go, Dr. Hugo Beltre spoke about various orthopedic injuries he has treated in many mind sports competitors, possibly the first such presentation at a mind sports conference. After a lunch break, the afternoon was devoted to a Cuban – American informal friendship matchup, and a demonstration of contract bridge. To this observer, Cuba seems to be a remarkably friendly and welcoming place. I am staying at a “Casa Familiar,” a very picturesque small hotel with seven rooms, a rooftop bar, and its own restaurant. Prices are almost embarrassingly low. My lovely room is only $40 per night, and I found a decent slice of pizza for about $.25. At the same time, there are surprising challenges. No Internet, and some wireless phone plans do not work here. You have to purchase a card and be in the right place to use it. But that adds to the charm – no Internet dishes, no cell towers, and forget about any chain restaurant you have ever heard of. There are two separate currencies, with similar denominations, but one is worth 25 times the other, so keeping them straight is important. Fortunately, the unfailingly honest and helpful Camagueyans were always eager to help. The streets, often barely wide enough for one car, twist and wind through the city, but the downtown area is small and easy to learn. Street traffic includes bicycles, pedicabs, horse-drawn carts, and a few cars now and then, many of them vintage autos from the 1950s. On a nighttime walk, I felt quite safe. Many buildings that seemed abandoned during the day turned out to be occupied, and the residents had thrown their doors and windows wide open. In many cases they could have reached out and shaken my hand as I passed without getting up. A group of perhaps 50 people had gathered in a side street, listening quietly as a middle-aged woman spoke passionately to them. When I passed by later on my way home, they were still there. 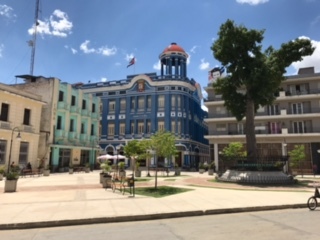 The conference continues tomorrow and Friday, and appears to be a harbinger of great things to come, in Camaguey and perhaps throughout Cuba. Dr. Bueno told us that the university plans to begin a serious program of research into the benefits of competitive games. Considering Cuba’s prominence in the world of chess, it seems likely that we can expect great things from our neighbor to the south. The next time there’s an event in Cuba, sign up if you can!